A day after Bihar Chief Minister Nitish Kumar accused long time ally Rashtriya Janata Dal (RJD) supremo Lalu Prasad Yadav of being smothered in corruption, the latter on Tuesday hit back asserting that his long time friend turned foe is a 'turncoat' and he (Nitish) is known for his dubious character. Speaking at a press conference here, Lalu said, "I know Nitish Kumar from the beginning as I'm senior to him. He is one big 'Palturam' (turncoat) whose true colours will soon show. From the very beginning, he is known for his dubious character. Nitish has forgotten the days when he used to take my blessing and go for any political debate or talks". "Yesterday when he accused me and my family; I knew it was coming. As he is not a man of his words. He has also forgotten the day when I made him rule the state and join my alliance with open arms. It was only because of Mulayam Singh that I agreed to accept him in my party. But today I regret of the time spent and the moment lost," he said. Taking a jibe at Prime Minister Narendra Modi, Lalu said that Nitish used to speak ill of BJP and today he is singing their glory. "Till yesterday Nitish was accusing Prime Minister Narendra Modi now suddenly he is singing his praises and calling him the "biggest leader" in the country. This comes as a shock to me! He also added that there is no one who can defeat him.. (Smile). I know Nitish's intentions as he wants to sacrifice my children for his glory and name," Lalu added. Yesterday, Nitish, while addressing his first press conference after joining hands with the BJP, declared that no one is capable to face and beat Prime Minister Modi in the 2019 Lok Sabha elections. He praised Prime Minister Modi, calling him the "biggest leader" in the country and added that "there is no one who can defeat him." Nitish also explained that he had given his long time friend Lalu Yadav ample opportunities to explain the charges of corruption against him, but to no avail. If Lalu had explained himself over the corruption allegations, then situation could have been different in Bihar, Nitish said. 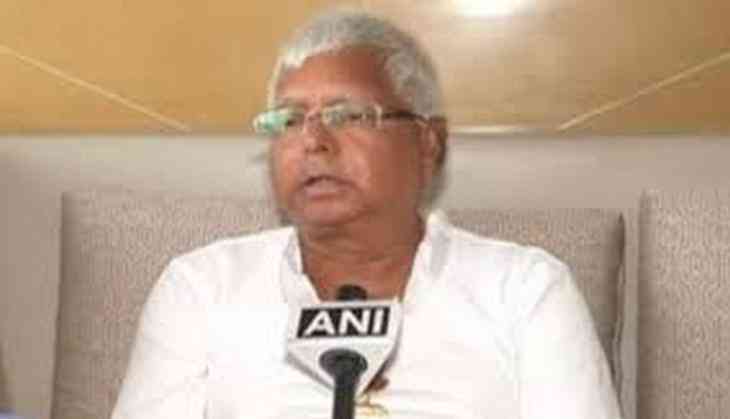 "I had asked Lalu to clarify the allegations of corruption against him and put the facts forward. It will send a positive impact on the public and which is also good for 'mahagathbandhan. I have tolerated everything, thought this happens in alliance as I didn't have a choice. I continued my work for the betterment of people," he added. Meanwhile, Lalu has invited the Janata Dal (United) co-founder Sharad Yadav to lead the fight against the BJP and Nitish , who, according to him, joined hands with "communal and fascist forces and betrayed the people's mandate". "Nitish has tarnished the image of Ambedkar. I urge Sharad Yadav, whom we consider the true leader, to travel to every corner of the country and come to Bihar and join our fight against the BJP and Nitish Kumar," Lalu told ANI. On July 26, Nitish resigned as the chief minister and ended two-year alliance with the RJD and the Congress over corruption charges against his deputy and Prasad's son Tejashwi Yadav.